(December 05, Colombo, Sri Lanka Guardian) The Lessons Learnt and Reconciliation Commission (LLRC) is visiting Trincomalee from December, 3 to 5 and it had already held the first session at the Trincomalee Kachcheriya. During this session on December 3rd, 136 complaints were lodged by the residents of the area. 67 complaints were on abduction, 40 on missing persons, 17 on detainees while 11 were on other issues. Its disturbing to see nearly 110 cases of disappearances in an area which has been under the government’s control for decades and during the sessions it was revealed that certain groups are engaged in systematic extortion promising to secure the release of lost relatives. 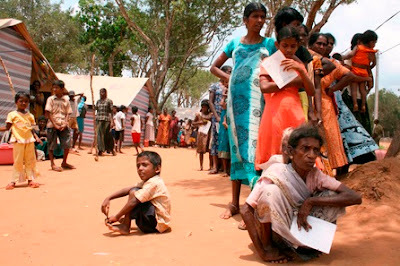 However learning from the events which transpired at Kaytes Island and repeated pleas of CHR Sri Lanka the LLRC had encouraged people who fear future persecution to give evidence before the camera. During the session at Kachcheri several individuals used this facility and it had encouraged people to reveal sensitive information without hesitation. CHR see this as a very much positive step forward. Nevertheless in a repeat of the Kaytes sessions there were reports that many villagers were not informed about the venues and dates of the LLRC sessions. Many villagers including Thambalagamuwa and Kappathurei were not informed about the sessions by the Grama Niladaris and that must have prevented the participations of large number of residents. In addition many submission forms on missing persons were in Sinhalese and English, two languages that are alien to most. The LLRC will be in Trincomalee till December, 5 and it will visit Muttur today (Dec. 4th) and Kuchchaweli on Sunday (Dec. 5th). CHR is closely monitoring the sessions in Muttur where hundreds who have been affected by the special economic zone is set to appear before the LLRC to seek redress about their lost property.